Uber and Crime Stoppers International will begin rolling out a new partnership aimed at providing driver-partners with tools to report potential criminal activity while keeping their identity anonymous. Jacksonville is one of five initial launch markets in the United States. Drivers in Jacksonville received a message today announcing the new partnership and also providing the details to report potential crime to the First Coast Crime Stoppers hotline and online portal. So far this year, Uber’s global team that works with police on investigations has doubled, and our team of about a dozen former law enforcement professionals has briefed more than 250 agencies on how Uber can be a resource to help solve crimes. Crime Stoppers International is a global nonprofit organization representing seven regions committed to support law enforcement efforts to prevent and solve crime by mobilizing citizens to anonymously report illegal activity. Uber and Crime Stoppers share a common goal of making it easier to anonymously report potential criminal activity. We have committed to signing the Hague Accord at the Crime Stoppers International conference in the Netherlands. By signing the Accord, we will join other major corporations and governments in endorsing the concept and value of anonymous crime reporting. 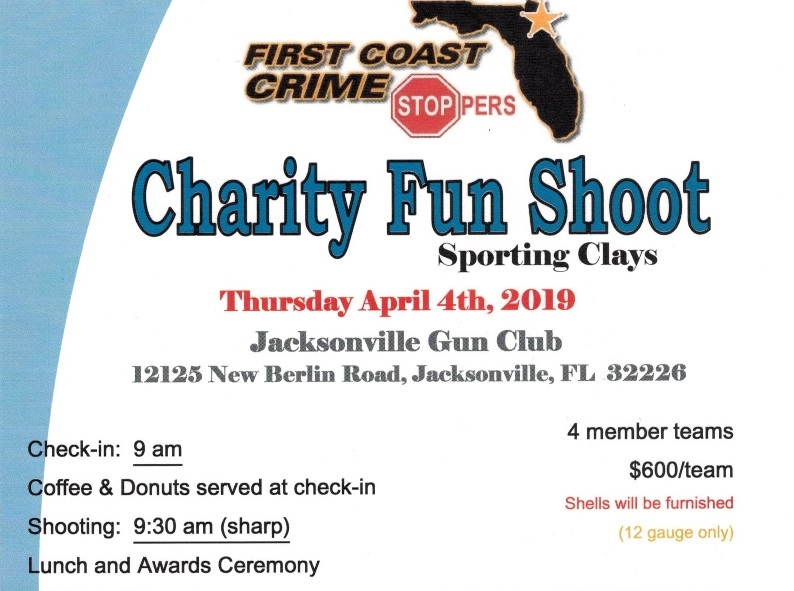 Come join us for our annual Charity Fun Shoot Sporting Clays at the Jacksonville Gun Club on Thursday, April 4th, 2019. Check in is at 9am with coffee and donuts served. Shooting starts at 9:30am. Awards Ceremony and Lunch will be served after the shooting is done. Click on the link below for flyer.